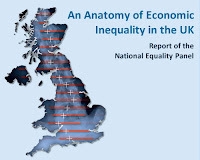 A new government-sponsored study from the London School of Economics, entitled An Anatomy of Economic Inequality in the UK, which The Guardian says is "more ambitious in scope than any other state-of-the-nation wealth assessment project ever undertaken," makes for sobering reading. Perhaps its most startling conclusions are that the richest 10 percent of Britain's population is over 100 times as wealthy as the poorest 10% of society, and that inequality has reached its highest level since government began recording it. The UK also now has the seventh worst inequality in the OECD, ahead of only Mexico, Turkey, Portugal the United States, Poland and Italy. Some people think that the great recession will have caused some kind of "reset" of the trend and that we will now start to see inequality falling, just as happened after the Great Depression. Not so: the key difference between then and now is that the Depression caused political revolutions around the world, with politicians succeeding in bringing Big Finance, and inequality, to heel. Now, despite the half-hearted and/or belated moves by Barack Obama, Gordon Brown and others, finance remains firmly in charge in politics, and as a result inequality will keep rising, ever further into the stratosphere. "It is the 'horse and sparrow' theory of income distribution and its taxation. If you feed a horse enough oats, some will pass through to the road for the sparrows." How fortunate we sparrows are that the horse is so well fed. Gor bless yer, guvnor! But it's not just contempt that is the problem with this world view. To understand why inequality really does matter, read our summary of another vast research project into inequality, here.